Today's donation is a giveaway-style one, sponsored by Mr. Science Teacher! One homeschooled high-schooler in financial need will receive a completely free subscription. Did you know? As an email subscriber or Facebook page follower of this blog, you will never miss donations such as this! Mr. Science Teacher is offering a free subscription to one homeschool family in need. If you feel you are in financial need, please apply/enter below. This recipient will be chosen randomly, and entries are on the honor system. 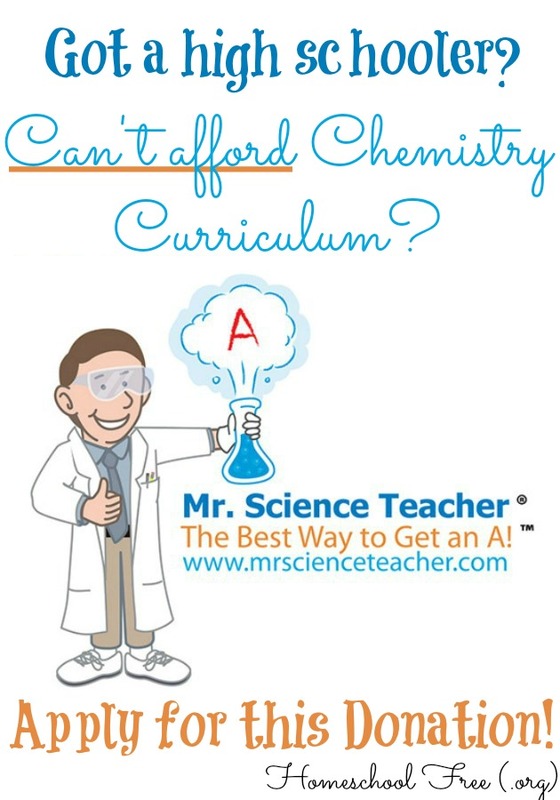 If you'd like to see a review of Mr. Science Teacher, click over at The Frugal Homeschooling Mom for a recent one. Don't worry, your information is never shared. Signing up for our email list is always optional, never required. Please remember, this donation is, as usual, meant ONLY for families who can not afford to buy this subscription for themselves. if you wish to give to a specific need by an application process, or if you wish to provide a product you created/own via a "giveaway-style" donation. Please contact Deana at thefrugalhomeschoolingmom[at]gmail[dot]com to donate in this manner. We are always glad to accommodate all reasonable requests.